Mahanagar Telephone Nigam Ltd (MTNL) today announced the launch of new promotional True Unlimited 3G data Pack just for Rs.999 and for 3G prepaid subscribers in Mumbai circle. Earlier the Unlimited 3G data pack comes for Rs.1650, now MTNL has introduced new prepaid 3G data pack priced at Rs.999 offers True Unlimited 3G Data usage (Home and Roam) without any FUP for 30 days from the date of recharge. This new 3G data pack of Rs.999 is promotional offer of 90 days, valid from today i.e. 22 Feb, 2014 to 22 May, 2014. 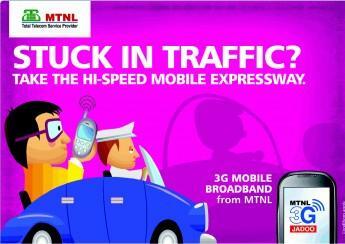 MTNL Mumbai’s all 3G data plans/packs can be use while Home network as well as National Roaming on BSNL across India. The New True Unlimited 3G data Plan of Rs.999 will be available from today via On-line Recharge at MTNL website or E-topup at MTNL Customer Service Centers and retailers across Mumbai circle. whether mtnl delhi have same plan ?